Tauber Oil Company of Houston has become the West Calcasieu Port’s newest tenant. Tauber Oil becomes the sixth tenant of the port and is providing ultra-low-sulfur diesel to inland marine vessels. 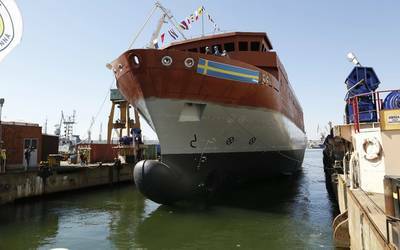 This service enhances vessel stops at the port that already provides the following marine services – barge fleeting, wet-barge cleaning and stripping, dry-barge cleaning, marine construction and diesel engine repair. “By combining our industry experience and buying power, we provide our customers with quality ultra-low-sulfur fuels that exceed industry standards Our products are delivered on time and at competitive prices,” he added. “We currently operate another fueling operation in the New Orleans area and have established a solid relationship with those inland barge operators. “Adding a highly recognized company such as Tauber Oil to the port‘s portfolio of tenants only compliments the efforts taken to grow and expand the highly valued waterway,” Hohensee said. 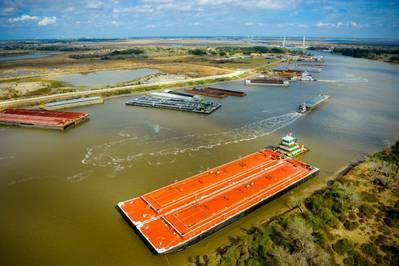 He added that recent growth of business and industry in Southwest Louisiana and anticipated regional industrial expansion is expected to ignite an unprecedented growth in shallow-water barge fleeting support to move feedstock and finished product. “By adding a marine fueling service to the West Cal Port’s array of current marine services, we are ready for the growth of marine vessel business. The added services of Tauber Oil will support our growing businesses and industry base in our region of Louisiana,” Hohensee added. “The success that Tauber Oil has enjoyed since it was formed in 1953 is based on quality products and competitive prices with a full array of first-class service,” Tauber said. Tauber praised the cooperative efforts of the West Cal Port board of commissioners and the Calcasieu Parish Police Jury that paved the way to bring Tauber Oil onboard at the port. To meet the infrastructure needs of the Tauber Oil’s fueling operation; the West Cal Port applied for and received an economic development grant from the Calcasieu Parish Police Jury. The West Calcasieu Port offers waterfront property on the GIWW as well as more than 100 of its 190 waterfront access acres available for leased development.